Over the last couple of years, I have been re-reading the Psalms. 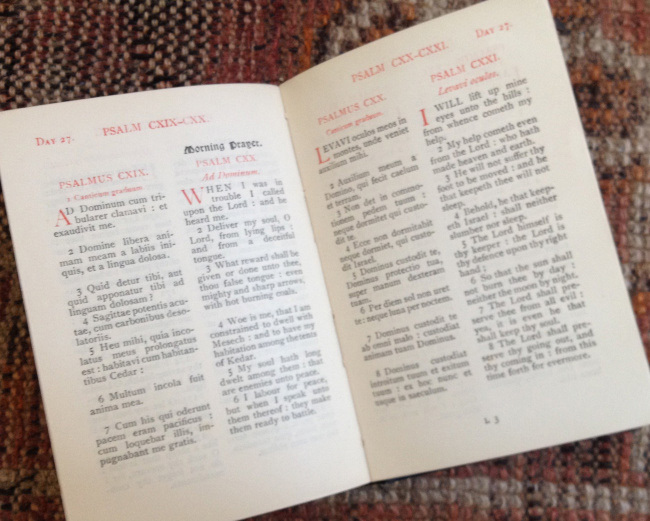 I was brought up in a Church of England family, and went to Church of England and Roman Catholic schools, so I am familiar with the psalms from church liturgies. However, I don’t think I have ever read the psalms straight through before. And although I’ve been a Christian for much of my life, I wouldn’t call myself one now – theist, yes, but not a Christian. I don’t know why I decided to re-read them again, but there is sufficient distance from the Christian that I once was for me to be able to read them afresh. 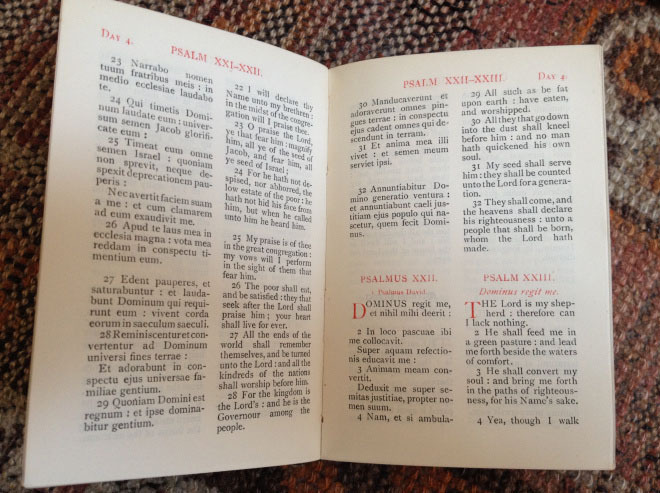 My reading copy of the Psalms is this nice little cloth-bound and gold-tooled copy which I bought for £1 in a second-book shop in Hay-on-Wye on one of our summer holidays in the 1990s – so it has been with me for some time! 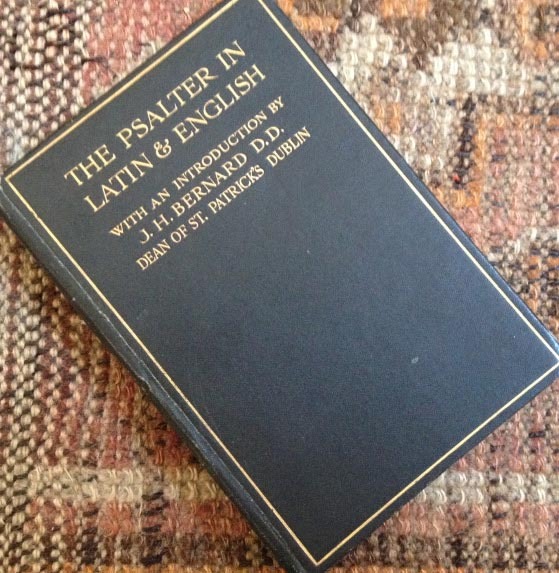 It has the benefits of both including a Latin translation and red rubrics. Don’t know what red rubrics are?! My mother was obsessed with them! – no prayer book or Bible came up to scratch unless it had red rubrics. They are the red letters denoting the titles and numbers at the beginning of each psalm – and actually my mother’s phrase “red rubrics” is a tautology because the word rubric is also a reference to the redness of the script. They do look nice – perhaps my mother was right to place so much importance on them. As for the Latin – well, in my youth I was a student of Latin, and I still find it a helpful gloss on places where the English text is curious. This is a very old English translation, and it is salutary to remember what it cost some brave and very principled men to give us a translation in the vernacular. Miles Coverdale (1488-1569) is credited with this version but his translation was based on those by William Tyndale, Martin Luther and others. Some of these men died for the principle of providing a Bible that everyone could understand; others experienced long periods in exile and many trials and tribulations. It is almost beyond our modern comprehension that some five hundred years ago, you couldn’t hear the texts of your own religion in your own language (nor read them either, but then most people couldn’t read anyhow). There are all sorts of treasures to be found in the Psalms. But the psalmist is also good on comfort: “Thou tellest my flittings; put my tears into thy bottle: are not these things noted in thy book?” (Psalm 56) What an exquisite image of our tears being so valued that they are bottled! Evocative language just flows from Coverdale’s pen, and one of my favourite psalms (and I think the most beautiful) is Psalm 121. A psalm of great comfort, it is commonly read at funeral services because of the last verse: “The Lord shall preserve thy going out, and thy coming in: from this time forth for evermore.” It is the first line of this psalm that intrigues me most (of perhaps all the lines in the psalms). 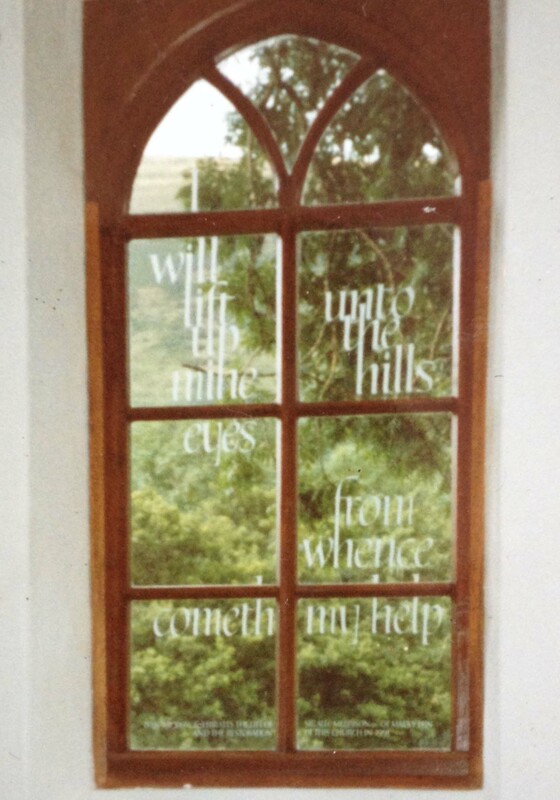 I will lift up mine eyes unto the hills: from whence cometh my help. Some years ago we found it engraved on the window of a small church of Capel-y-ffin in Wales. The trees were a bit overgrown, but you could just see the hills behind that the little window looked out on. What a beautiful use of the psalm! So comforting, so reassuring – but why? What is there in the hills that is so full of help? Perhaps, like me, you have Boney M’s version in your ears now?! It’s the story of the Jews in exile, of course, who cannot muster their spirits to sing as their Babylonian captors demand – a despair shared with other captives, at other times, in other places. In the Iliad, Homer wrote poignantly of Andromache lamenting to her husband, Hector, about the treatment she could expect as a captive when he was dead. In recent times, we have heard the heartbreaking stories of Yazidi women taken into slavery and Nigerian girls stolen from their land. This Jewish lament in the psalms is the song of all these captives. The beauty of the lament moves us just as much the anguish expressed. Now – there’s something else in this little book – something that I missed until now, and I can’t think why I didn’t see it before! There is a purple stamp on the front page. 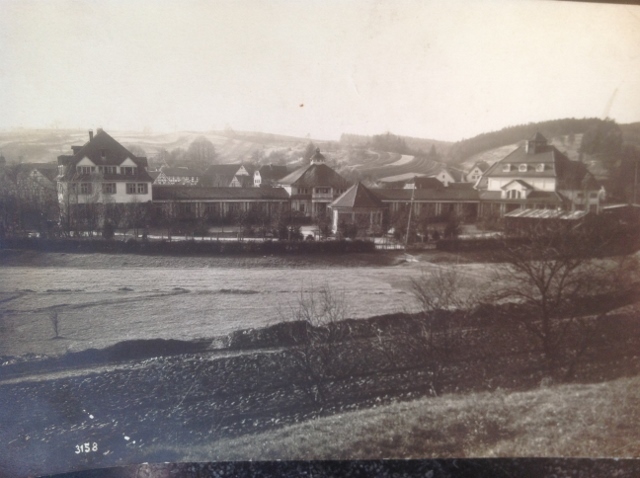 Researches on the internet reveal that it is the permission stamp for the prisoner-of-war camp at Bad Colberg in Saxony where captive British officers were housed during the First World War. Look at the front page. I reckon that there are four hands here. Somebody has printed J.H.Goodall at the top of the page in pencil. There is a £1 marker below that. Then somebody has written JHHGoodall in ink – this looks like a signature of ownership. Below that is my name, and my notes on where I acquired the book. We can account for the £1 price marker too as it is linked with my acquisition of the book. But the printed pencil name and inked name are the same and it has always puzzled me why there is this duplication. It is likely that the ICRC supplied small religious books as well as letters and parcels to POWs. This would explain the pencilled name at the top of the page, and the personal signature below. I just hope this little psalter was a comfort to him. Extraordinarily, I even found a photo of Captain J.H.H.Goodall – aah, the miracles of the internet! 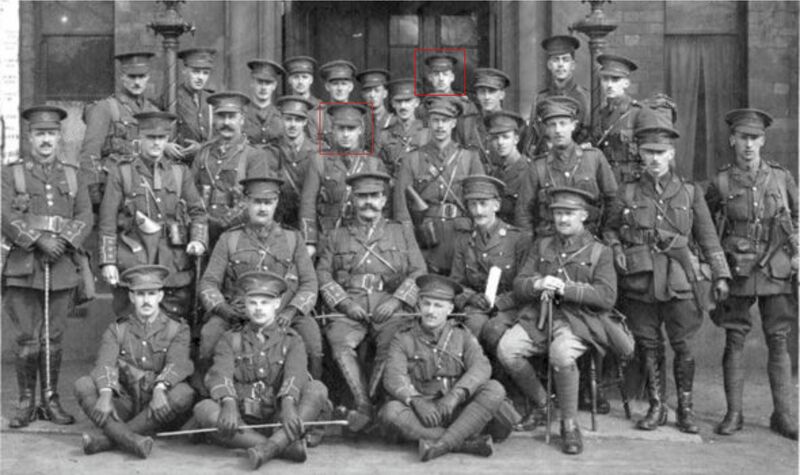 (He is standing at the very back – he was nearly 6 foot tall – , and his brother, Marcus, who died in the fighting on the Somme, is in the row just in front of him. This photograph, taken on April 13th 1915 on the steps of York Baths, courtesy of the Yorkshire Film Archive.) Finally – and almost by chance – I happened upon the full story of Captain John Humphrey Herbert Goodall and his courageous war service on the Hazlewood School Great War Roll of Service webpage. I must say, that post kept me from my weaving this morning! On many levels it touched me and Captain Goodall never gave up did he? ‘Red Rubrics’ had me remembering my neighbors house as a child. we were Catholic and they were Presbyterian. They had a HUGE bible with JEWELS on the front cover 🙂 but everything that Jesus had said was printed in RED!! Just fascinating for me and this house was a treasure. You could eat off of my mother’s floors but at Mrs. Glasson’s house all was ‘chaos’ and I loved it…kittens, making soap, slips of plants everywhere, sheet music everywhere (piano, French horn, 2 girls) and on and on. It is why I am so schizophrenic re housekeeping……keep it pristine or have FUN. Fascinating reading what you had to say, Susan – religion is so powerful in its influences, and tidiness! – my mother was like yours! These things embed themselves in your very soul – no matter how much you may want to change them. Loved your description of that Protestant Bible – jewels on the front – wow!! Isn’t it so amazing the stories you can find when you start to look? I am so glad he survived the war! Yes, I absolutely agree! I am just amazed that I have had this little book for so many years, never known about the previous owner and now discovered such a poignant tale. I held my breath as I looked to see if he had survived the war or not. This post has stayed with me for days, I even dreamed it last night. A very fullsome post. 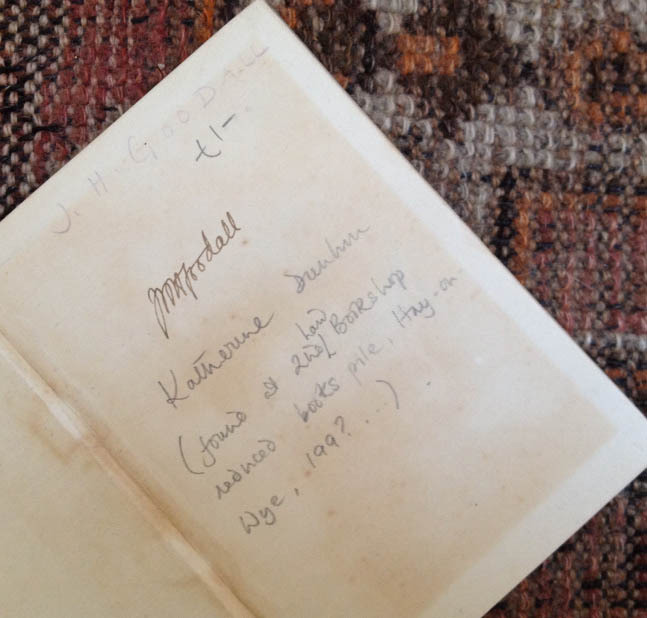 How extraordinary to be able to trace the owner and let us hear part of his story. I grew up Catholic. We certainly didn’t get to see the bible like that, in fact I think we learned more about Catholicism than Christianity! Oh dear – I hope it wasn’t a disturbing dream! As I said in reply to Susan above, I think the religion of our childhood is very powerful, and sits unbudging in our subconscious. And wow – yes! – were they keen to teach a whole host of rules and regs that had nothing to do with the Bible!! 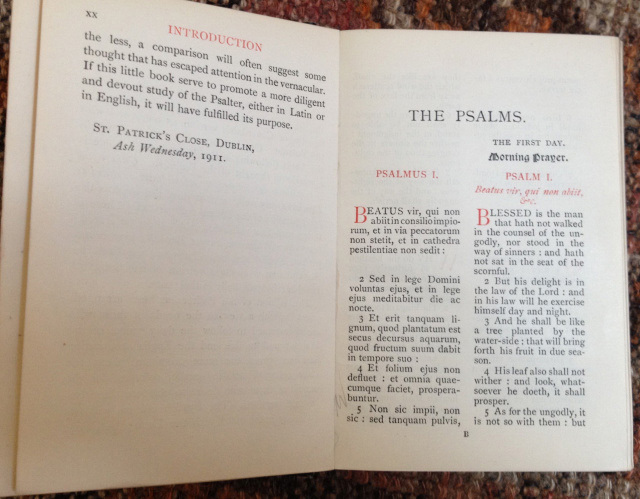 It’s taken me quite a while to put this blogpost together – to distill my thoughts on the psalms that I had read. 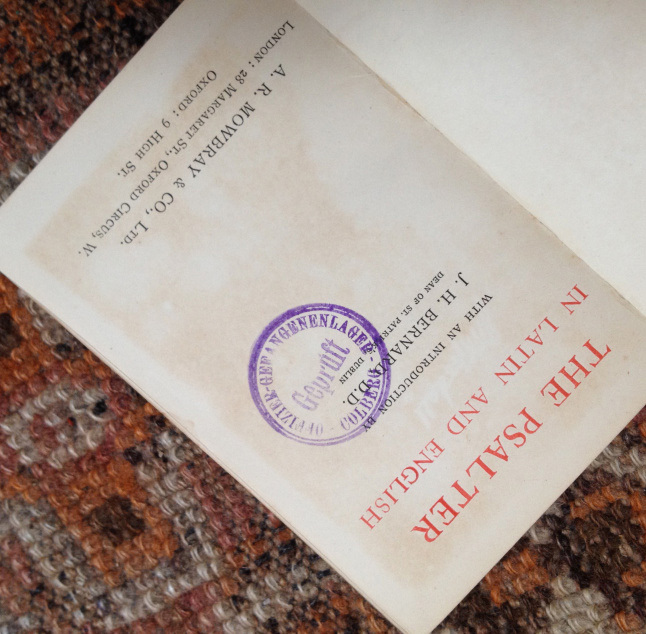 The history of the book’s ownership was a wholly unexpected extra bonus. How very inspirational this post is, it makes me want to read them! We didn’t grow up with religion in the house so I guess my (quite strong) associations must come from Granny and boarding school. I used to enjoy the chanting of them at school, the way everyone somehow stuck together just by the ‘pointing’, quite an ensemble miracle really. The language really is thrilling and evocative and as you say speaks to the whole of the human condition, especially suffering and the need for comfort. I love the links you made with the present day, and how poignant to be able to track down the previous owner and give him some airspace on this extraordinary tool of the Internet we have. Interesting to hear your memories of psalm singing, Polly, – quite a miracle that we all managed to follow the pointing to sing together! Also interesting to hear how influential Granny was for you – she talked religion all the time, didn’t she? I couldn’t agree more about the wondrous ways of the internet!! I loved reading this. Sleuthing can be so satisfying and second hand objects open us up to two worlds – the object itself, and the lives connected to it. So glad you enjoyed it – I think the sleuthing instinct is very strong. I’ve found that since I got to a “certain age”, I think about my ancestors and their lives and wonder and wonder – of course, you never really know because the facts that you can discover like birth and death dates don’t really tell you much about a person. I guess that’s why an object adds the extra element of fascination: I have no way of knowing if Captain Goodall treasured this book or not. His father was a minister in the Church of England, so presumably he grew up with a religious faith. But the horrors of the 1st World War drove many people to atheism.